I attended the Tucson Miniature Society Show this past Saturday and thoroughly enjoyed all the amazing dollhouse creations, some shopping, and garnering ideas for the next round of Club Little House (no, I’ve no idea when or if Amy will do this—but just in case…). 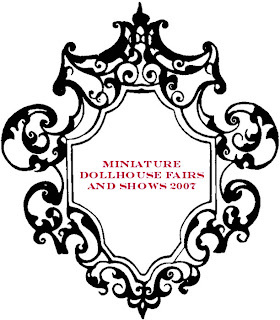 This started me wondering what other miniature shows are out there. So I’ve been researching and thought I’d share my findings with you—both U.S. and international. I’m going to post the schedule in two separate posts. This one is for the balance of 2007. I was there too June! Too bad we didn't discuss it first! My favorite was the "Fairy Lady". She was magical.